Sitting at long tables with bibs on as big pots filled with lobster, potatoes, sausage, artichokes, corn, garlic and shrimp were spilled out in front of us, it was on! Everyone grabbed a lobster and was almost ready to go. What else did we need? A glass of wine, of course! 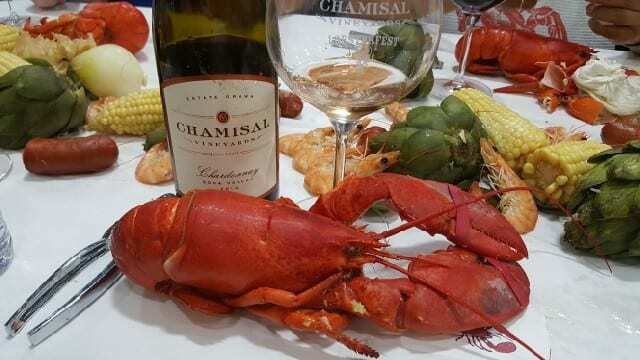 And the wine for the night was the Chamisal Vineyards 2015 Estate Chardonnay, a perfect pairing for lobster and hence the Please The Palate pick of the week. Each time a new restaurant opens up on Ventura Blvd, between Studio City and Sherman Oaks, I get excited. I love seeing the area I grew up in become a dining destination. Not only does it mean that my parents and friends who live in the valley don’t always have to drive across the city for a good meal, but people in the city have no excuse not to come to the valley. Sherman Oaks’ new steak and seafood destination, SOCA, is a good reason to head to the valley. SOCA is located in the space that formerly housed Cafe Cordial. 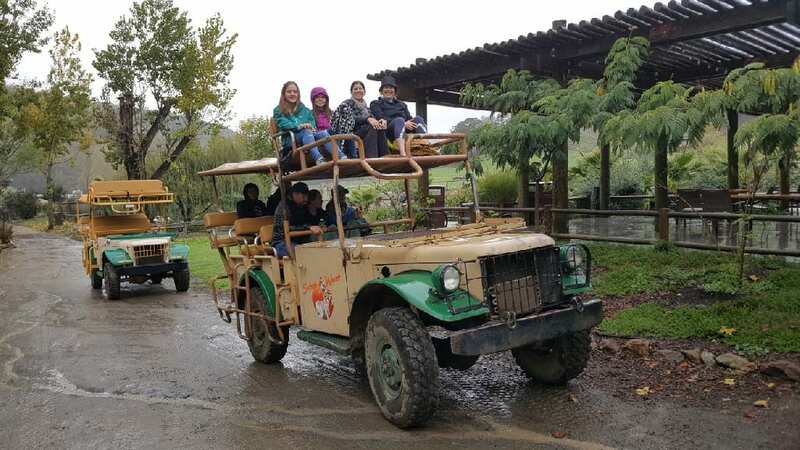 If you live or have lived in that area, it is highly likely you attended a bridal shower, baby shower or birthday brunch at Cafe Cordial over the years. Gone is the gold lettering, replaced by a yellow trellis that stands out on the street. Inside, the wood-steeped interior is filled with light brown couches and banquets, glass windows that allow you to look into the kitchen and a bright bar that lines one wall. The color palette of sea blue and cream and the bright sunlight streaming in from the patio make the space friendly and inviting. Inside SOCA, there is a 70-seat dining room perfect for dinner but it is the 28-seat patio where you will want to enjoy lunch. SOCA is casual with funky music playing; it is a place for a good time. SOCA is owned by Chef/Owner Aaron Robins, a local valley boy who, along with Rory Snipes, owns Boneyard Bistro a few block east. While Boneyard Bistro brought barbecue and bourbon to Sherman Oaks, SOCA is offering lighter food with a global influence. While building SOCA, Aaron is focused on mentoring as well. He has put together a core group in the kitchen that includes Oliver Krant who previously worked at Pok Pok in Portland and Gwen in Hollywood. Joy Cuervas, who worked at Bouchon, is doing all of the breads and desserts in house. Aaron lets his team showcase their talents in the kitchen while introducing them to the rest of the restaurant game. And showcasing their talents, they are. I was invited to check out lunch at SOCA where small plates, salads and sandwiches are offered that embrace South American and Southeast Asian cultures, as well as French techniques. The menu is not homogenized and there is a diverse selection of options to appeal to all palates. 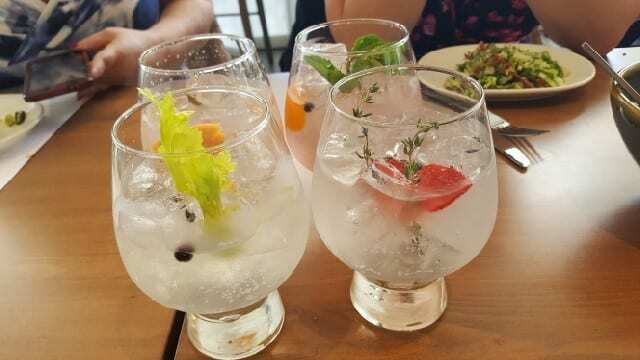 As you sit down in one of the comfortable leather couch banquets, start with a gin and tonic Spanish-style, meaning served in large glass bowls with colorful herbs and fruits. The Spanish Gin Tonics are listed by number and there are at least ten but only six are listed on the menu at any given time. For lunch, there are small bites such as shitake tuna tartare, Peruvian lobster roll and Korean Crab Dumplings ($15) with king crab, Korean chili, citrus san bai su, and kimchi slaw. 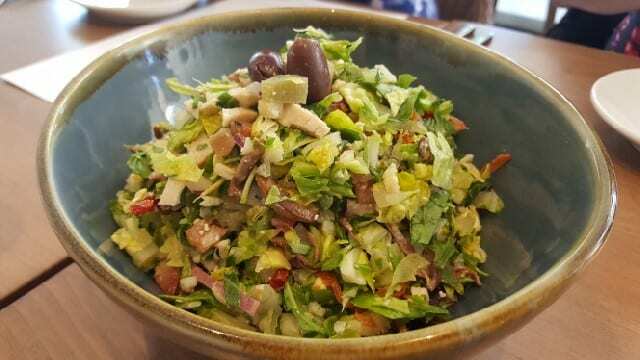 Salads include an Aji Panca Caesar, a King Crab Cobb and the Mediterranean Chop ($19) with grilled artichokes and shitakes, sun dried tomatoes, kalamata olives, fresh tomato, french feta, hearts of palm, salami, Mediterranean vinaigrette. 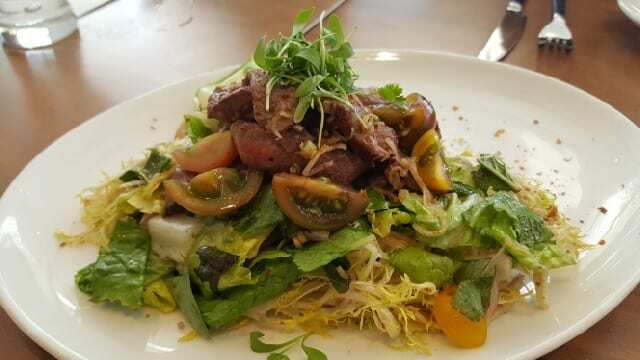 The fourth salad on the menu is the Southeast Asian Steak Salad ($20) with marinated grilled flank steak, Thai herbs, beef nuac cham, shaved lemongrass & shallots, and frisee. 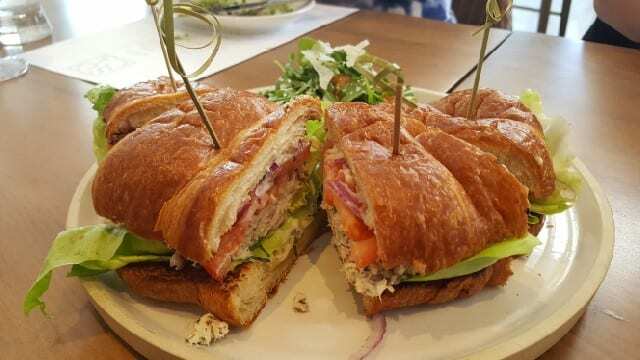 Under sandwiches, the Fresh Fire-Roasted Albacore Tuna Salad Sandwich ($19) with fresh herbs, caper aioli, red onion, tomato, and greens is served on a freshly baked croissant. 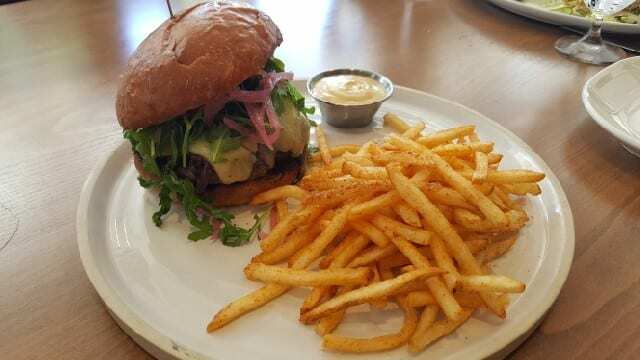 The Burger ($22) is made with Snake River Farms American Wagyu, Grafton cheddar, roasted shallot-tomato aioli, arugula, house pickled onion and shallot-sherry compote and served on a house made roll with fries. There is also a Roasted Turkey sandwich and a Dry-Aged Prime Beef Dip. 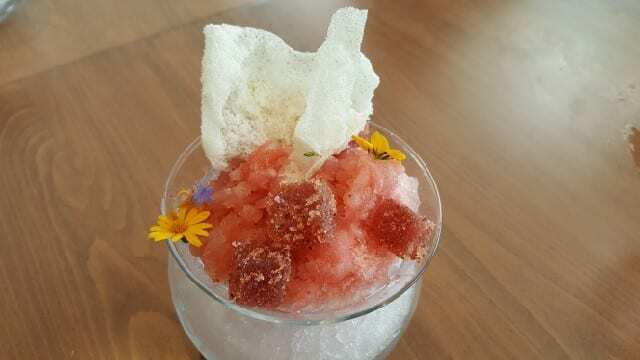 We finished our lunch with a refreshing Strawberry Raspado, a strawberry granita with rhubarb gelee, salt and a margarita chip. Sitting on the patio on a hot summer day, enjoying this dessert, I was transported to a beach-side resort in the Mediterranean. But, I was in Sherman Oaks! I am very excited about this new addition to Ventura Blvd.